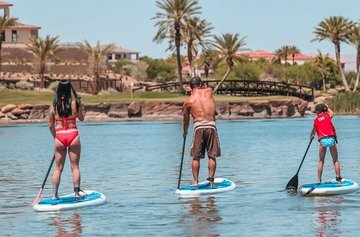 Enjoy stand-up paddleboarding on the smooth, calm waters of Lake Las Vegas. The no-wake, 320-acre lake is a desert oasis located in the Las Vegas Valley. Check out the beautifully-landscaped developments along the shoreline, which also boasts palm trees, bridges, and pedestrian pathways. The lake is just minutes from McCarran International Airport and the Las Vegas Strip, but feels like a whole other world.